Trailhead. The Big Idea that Fundamentally Changed How Trailblazers Learn. Yes, Trailhead is an online learning platform with self-paced, bite-sized content, but it’s also so much MOAR! Trailhead is an ethos, a philosophy, a way of Salesforce-life. By adding the gamification element, Trailhead has inspired a whole learning movement within the Salesforce Ohana. And it’s from the total embracement of Trailhead — the pioneering spirit of a new way of learning — that the idea of the Trailblazer was born. A pioneer, an innovator, a lifelong learner, a mover and shaker. A leader who leaves a path for others to follow. Most importantly, a person who builds a better world for others. Mission to Mars, and beyond. At its core, Trailhead enables you to learn what you need, when you need to learn it. Content is delivered in short, bite-sized chunks — called units — that are designed to be consumed in 10–15 minute segments. This isn’t just technical info, our goal is to transform how you learn and use Salesforce by radically simplifying and redefining the learning experience. 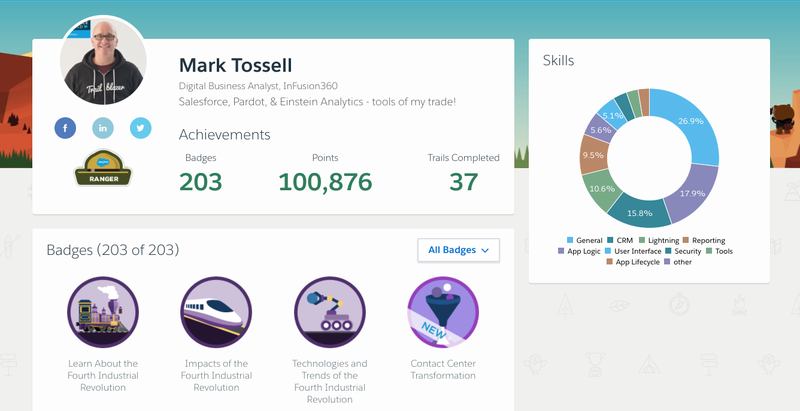 Gamification adds another dimension to learning on Trailhead. When you reach the end of each unit, Trailhead tests your newfound knowledge via a multiple-choice quiz or hands-on challenge in a real Salesforce environment where you earn points. Complete a module (narrative-style) or project (instruction-based) made up of several units, and you earn a badge to display on your profile, also known as your online resume. A collection of modules on the same topic are built into trails giving you a predefined path to follow so you don’t waste time trying to decide what to read and in which order. And for an even more custom learning path, you can curate different modules, trails, and projects into a trailmix (like a mixtape or playlist) to use yourself or share with other Trailblazers. As you collect points and badges, you move up through different Trailhead ranks. These ranks provide focus and inspiration, as either a challenge for yourself or to help promote a healthy level of competition within your teams as everyone chases “badgers” all the way to Ranger. Trailhead really is for everyone — Admins, developers, architects, business users, marketers, sales managers, and more. The beauty is, you can blaze your own trail by creating your own, personalized learning path. In addition to providing in-demand technical skills, you’ll find soft skills content — everything from equality to culture, storytelling to coaching, and hiring to career exploration. Trailhead is designed to empower you to become the most well-rounded Salesforce professional you can be. Fostering strong relationships and building a culture of Ohana is core to our DNA. So you’ll also discover content that focuses on Salesforce values from how to Cultivate Equality at Work to the Salesforce Ohana Culture; from the Salesforce Ecosystem to how to Manage the Salesforce Way. Trailhead gives you the tools to learn the technologies and skills necessary to land a great job in today’s workforce, regardless of where you live and what your background may be. And, more than that, you can put your skills to use to build a better world for others. “Learning Salesforce didn’t help my career at all…” said no one, ever! 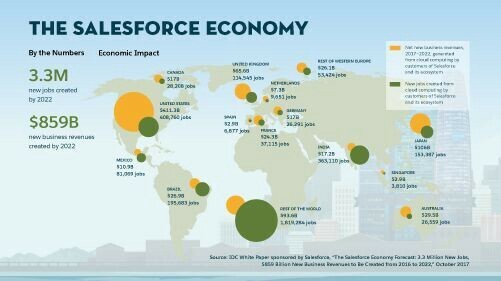 The IDC reports that demand for Salesforce-skilled people will create 3.3 million jobs in the Salesforce ecosystem by 2022. That’s a lot of opportunities for a lot of people! The magic formula of Trailhead is the continuous circle of learning that serves as your path into the Salesforce economy. But what does this actually mean? Trailhead helps you LEARN the skills you need to become a Salesforce expert in a multitude of areas. 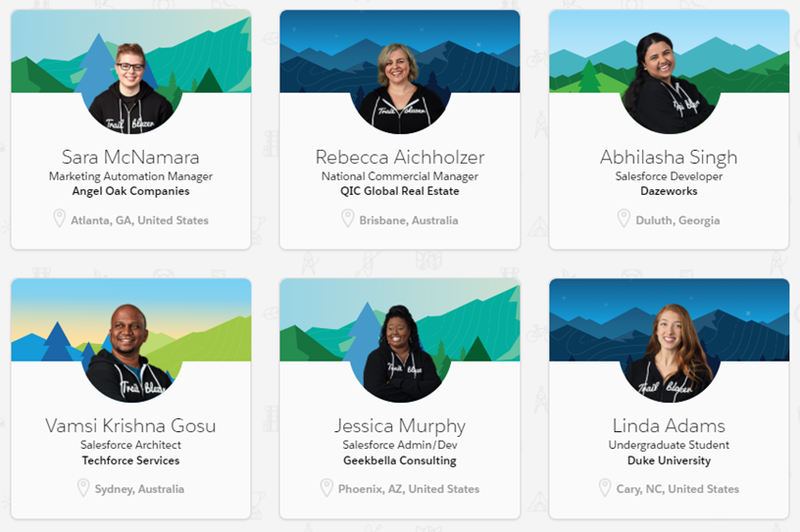 You can take these skills and EARN a credential such as a skills-based superbadge or certification to prove you know your Salesforce-stuff, and help build your career. Plus, you can CONNECT with fellow Trailblazers in the Trailblazer Community to share ideas and solutions, network, and support each other. The secret sauce of Trailhead. There’s no secret really, it’s quite simple. We make learning all about YOU! You choose the place, time, and topic. Trailhead provides an interactive learning model that’s fun. And we do all this with Trailheart, by being passionate about both learning and enabling our community of Trailblazers to be the very best they can be. If Trailhead is what we do, Trailheart is both the why and how we do it. Salesforce is all about Ohana — our family of customers, employees, partners, and communities. And Trailhead is not only about learning, but about connecting with the community to drive the way people and companies transform with Salesforce. It’s about supporting the Trailblazers, the change makers, the people at the forefront of this transformation. For a healthy dose of inspiration, dive into our stirring stories of Trailblazers all across the globe. These stories not only celebrate successes, but also the courage, humility, and pure grit of Trailblazers from all walks of life. These are people, just like you, who use their passion to elevate their careers and share their knowledge with others. So, if you’re looking to get started with Trailhead (there’s a trailmix for that!) or you’re a Trailhead-fan chasing all the badges, be sure to share your story with us. #Trailhead Marketing at @Salesforce. A kiwi living in the British Isles who believes in the power of good storytelling. Hear the story behind Salesforce Trailhead - the app, content, marketing, and community, and how all these wonderful things come together to make magic. Learn how we are bringing our Trailblazer spirit to everything we do and why it matters.